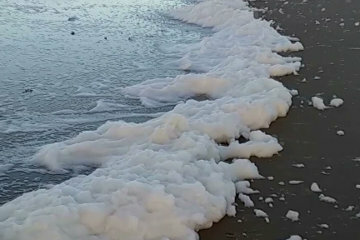 I believe that spume is caused by algae in the sea, often the breakdown of an algal bloom. It isn't the algae themselves which cause the foam, but a mass of dissolved organic matter - proteins, lignins and lipids. It doesn't sound terribly nice! Of course, living relatively close to Liverpool and its antiquated sewage systems, as we do, suggests and even less pleasant source for all this dissolved organic matter! There was a 26.4 mph wind blowing onshore, which doesn't sound like much, but when you are out in it you can really feel it. It was interesting to see chunks of sea foam being broken off the mass at the edge of the water and scudding across the sand and even up the steps in the sea wall. The only sound in the video is the wind rattling in the microphone, so I've turned it right down to avoid annoying anyone.